Our licensed cosmetologist, Marina, performs skin care/ facial treatments, and facial massage. One hour sessions include skin steaming, manual cleansing of skin pores, microderabrasion, facial massage, and facial masks to improve skin quality and color. Individualized acne treatments are also available. 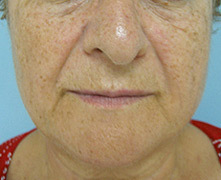 Fine wrinkles and dark skin spots develop with age. Skin discoloration frequently represents a skin condition called melasma (brown skin areas) or dark spots (hyperpigmentation) following acne breakouts. We offer several types of bleaching creams and chemical peels to achieve this goal. These treatments are painless and have a good safety record. Dr. Grigoryants will evaluate your skin and recommend appropriate treatment depending on your skin type and quality. Dr. Grigoryants’ Enhanced Cream – this effective cream provides bleaching, peeling, anti-acne, and anti-aging effects. The cream is applies once a day. Mild peeling will start in several days. Old skin is gradually removed and collagen produciton is stimulated which helps minimize the development of fine wrinkles. Many dark spots will lighten or disappear. Many patients with acne will notice significant improvement. Vi-Peel – is performed in the office. The procedure takes about 5-10 min. Peeling starts on day 4, refreshing the skin quality. LATISSE – is a new and very popular product that has been recently approved to stimulate the growth of eyelashes. Drops of this medication are applied to eyelashes once a day and within 1-4 months the eyelashes grow longer and thicker. 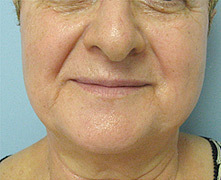 This patient-1 is shown two months after undergoing one treatment with a chemical peel. 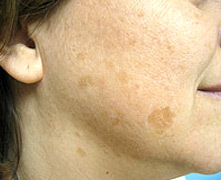 Dark skin spots were eliminated or became lighter.